My goal was to get to the gym 183 times, with a stretch target of 200. I made it exactly 200 times. I could have put in one extra day, but I decided to take New Year’s Eve and the rest of that week off as a reward for hitting my stretch goal. My number of weights days didn’t change much, which includes my all body routine, but the split between spinning and cardio changed significantly. My good friend’s morning spinning class got canceled at the beginning of October, so I had to switch to more conventional cardio for the rest of the year. Spinning isn’t going to be a part of my routing moving forward. One of other significant highlights for the year was making it to the gym every weekday during the month of October. This is a goal every month, but inevitably something seems to come up causing me to miss a day here or there. This was not the case in October and was a major factor in hitting my 200 day stretch goal. So overall, a great year. I can check this goal off as done – doubly so! I dialed back my walking to 500 miles for the year due to the loss of one of my walking buddies. I broke the goals into four, 125 segments. I successfully completed each one, and ended up at 538 miles total, which included a 4 mile hike to the top of Poo Poo Point (yes, it is an actual place, and that is its name) while in Seattle. 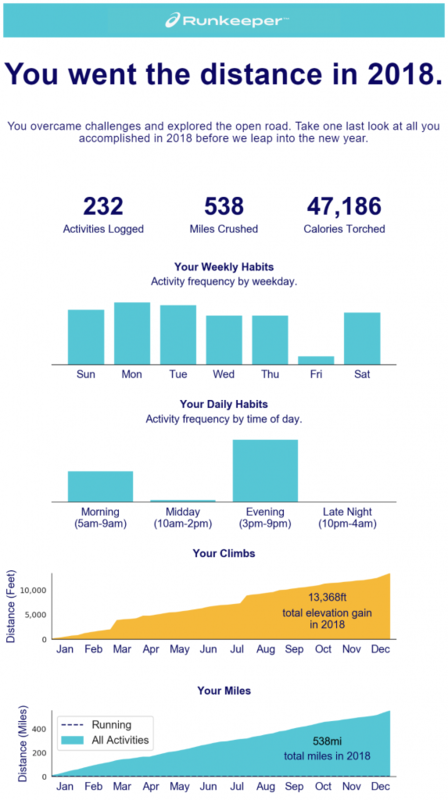 I track my activities in Runkeeper, and they sent me this nice summary at the end of the year. So I can officially check this off as done for 2018 as well. I did pretty good with diet in 2018. I’m not going to say it was my best year ever, but I did manage to stick with my reduced carbohydrate intake diet. I emphasize reduced because I don’t subscribe to the carb-elimination diet. I’ll still partake in the occasional pasta dinner, pizza feast, or carbohydrate side dish. I just avoid overloading on breads and am careful about portion sizes when it comes to eating carbs. In addition, I also have a chocolate addiction which needs to be fed regularly. I stick to dark chocolates, with my biggest weakness being the Ghirardelli squares of the 72% and 86% variety. I’ve also been known to dabble in 90% Lindt bars, and have even went as far as the 99% Cacao Lindt bars, which can take some getting used to. During the early part of the year, I did experimented with fasting. I did a few 24-hours fasts, which were pretty easy to knock out. I also did a 48-hour fast which was more of a challenge. I kept notes on the experience and hope to have them published on the blog soon. In short, it wasn’t an awful experience, and I’d like to develop a consistent fasting ‘rhythm’ in 2019. My weight for the year stayed right around 160 pounds, primarily in the 157-159 range. I consider that range my ideal weight. Anything below 150 would be too thin, above 165 is reason for me to evaluate my dietary choices. To be clear, I don’t set goals for my weight. I watch my diet, and let the weight take care of itself. The number is an indicator if I’m eating properly and taking care of myself. Therefore, I can use deviations in either direction that something has gone off the rails, either with diet or overall health. I’m going to give myself a check here, although there is always room for improvement. I like my working out goal and plan to stick with it for 2019. I’m planning to workout 70% of the available weekdays, which comes out to 183 days. I have the same stretch target of 200 days. I’m also going to track the activities, although I don’t have goals for each type. The only caveat is that I’d like to try an Orange Theory Fitness class once during the first part of the year just to see what it’s like and to understand what the fuss is all about. I’m going to stick with 500 miles for the year, broken down into four, 125 mile segments. I got a new walking companion in November, so I should crush this number. If (and when) I do, I’ll set a more ambitious goal for 2020. I’m not going to change my overall diet routine for 2018. I’m going to keep watching my carbohydrate intake and remain vigilant about avoiding added sugars in processed foods. The only change for next year is going to be an increased focus on fasting to see how my body responds. My goal is to do four 48-hour fasts, and sixteen 24-hour fasts during the year. I picked up a book, The Complete Guide to Fasting by Dr. Jason Fung and Jimmy Moore, to help me attain these goals, which I’ll admit are a tad ambitious. I’m not setting an overall activity goal for 2019. At some point, I would like to get a road bike and diversify my activity with more biking and hiking. For now, I’ll stick to walking and mix in the occasional hike when the opportunity presents itself. As I was at the start of 2018, I’m happy with how things are going with my fitness and diet routines. My challenge is to keep it up, and continue tweaking. This year’s experiment will be fasting. Quite honestly, it’s unfortunate that we have to run these ‘experiments’ on our body in real-time. It would be awesome if we could run simulations to see how our body would respond before trying things, but we’re not quite there yet. It is what it is for now, so I’ll just need to be careful and mindful of how my body responds and how I feel throughout the year.